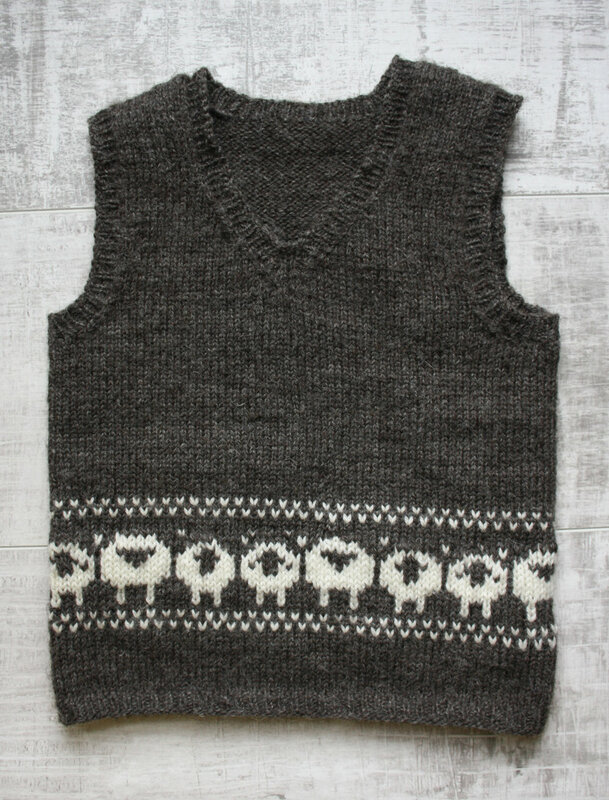 Wee Sheep Vest — Freehold Yarn Co. This lovely vest will see any child through those transitional weather months, keeping them warm on chilly spring days or as a layer beneath coats as the autumn closes in. With the light and almost silky Jamieson & Smith Shetland Heritage Naturals, we have made it a little more rugged by holding it double. This makes the vest a little more dense than typical, helping keep the wind out. This can easily be substituted with DK weight yarn. Sleeveless design keeps little bodies warm, hand free to get as wet and muddy as they desire. Wee Sheep Vest, as the name suggests, features these adorable sheep running around the lower part of the vest. The dense texture of the vest is very forgiving for beginners of stranded knitting, but pick colours with a good deal of contrast for the best result (MC: Dark Grey, or Shetland Black with CC White, Light Grey, Fawn or Moorit). Pick a unisex colour combo and you’ll be sure to have a vest that ends up ragged with years of wear from many different children as it becomes an adorable favorite. 5, (5, 6, 8, 10, 12) balls of Jamieson & Smith Shetland Heritage Naturals from Freehold Yarn Co. as MC. 1 (1, 1, 1, 1, 1) balls of Jamieson & Smith Shetland Heritage Naturals from Freehold Yarn Co. as CC. Photographed in Dark Grey (MC) and White (CC) Jamieson & Smith Shetland Heritage Naturals. Please note that due to the way the stranded knit pattern works, some of these sizes span a large size range, please modify length as required. Sizes 0 - 12 months and 1 - 3 years runs slim. All areas are noted for modifications, basic modification information for sweater conversion (needs own knowledge of cap sleeve working).